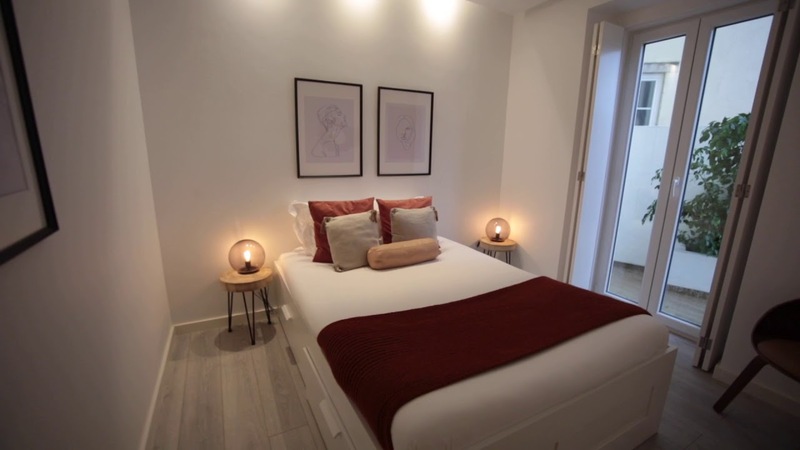 This stylish 3-bedroom apartment to rent on Rua Augusto José Vieira is a basement home. However, it’s on a hill and has a huge furnished terrace and a spectacular view of the city. The equipped kitchen is modern and has a dining table. The living room is chic. There are two comfy double bedrooms and one single, as well as two bathrooms. Penha de França is east of the city center. You can walk downtown in 20 minutes. Walking back home will give you a workout. This neighborhood is on a hill. Everything you need is close by, including a supermarket. And gyms, a mall, a cinema, and lots restaurants are a short walk away. Look at that patio - can it get any better? We loved the decor of this apartment. The bedrooms are bright and cosy. Sapadores bus stop is 5 minutes away. It serves route 730. Intendente Metro station is a 10-minute walk away. It serves the green line. Lisboa Santa Apolónia railway station is 20 minutes away.